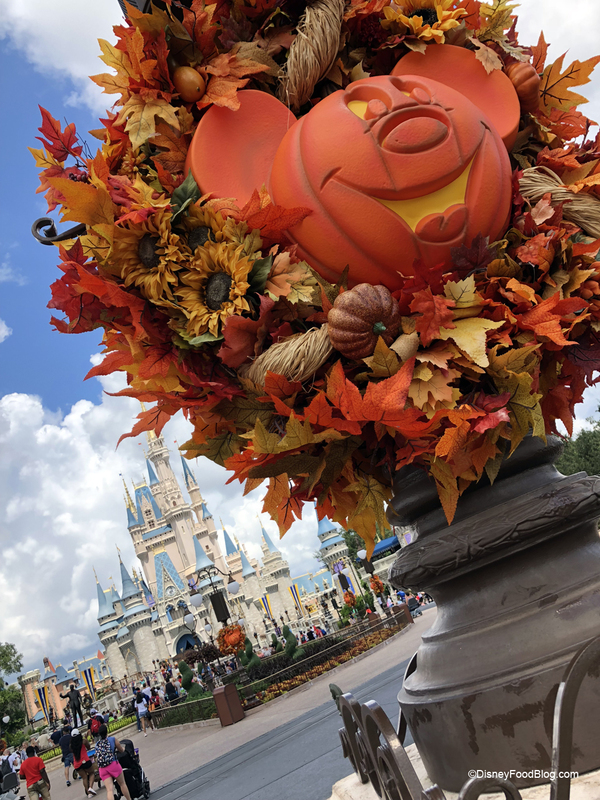 DFB Review and Food Photos: Lunch at The Plaza in Disney World’s Magic Kingdom! Greetings from Main Street USA! 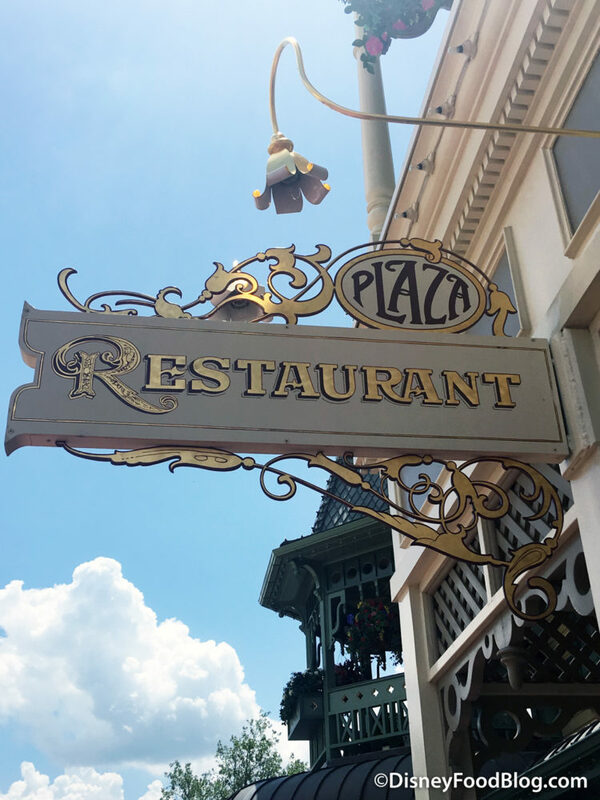 Recently we popped into The Plaza Restaurant to see if the comfort food eats were as good as we remember. The Plaza has been a long-standing underrated favorite here at DFB. Most Magic Kingdom diners aim to eat at Be Our Guest or Cinderella’s Royal Table, but for us, the Plaza remains high on our must-dine list. On our last visit, we were pleasantly surprised by all of the new lunch options. Let’s take a tour. It’s time to head to Flavortown with another visit to Guy Fieri-helmed Chicken Guy! in Disney Springs. This quick service spot arrived on the scene last August, and we thought it was great and affordably-priced. But honestly, over the past year it’s become a must-do for me on my Disney trips. I can’t stay away! OK, I’m particularly drawn to the sauces…as you can see. 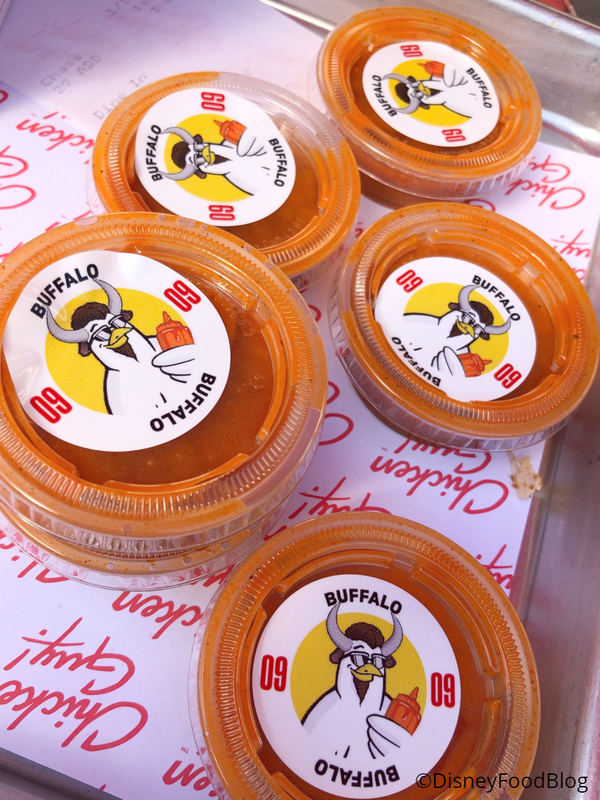 But don’t worry: you can get more than Buffalo. I just don’t. It’s time to Get Your Ears On at Award Wieners in Disney California Adventure Park — and this time, it’s gonna get cheesy! As it should when we’re celebrating Mickey and Minnie Mouse, right? 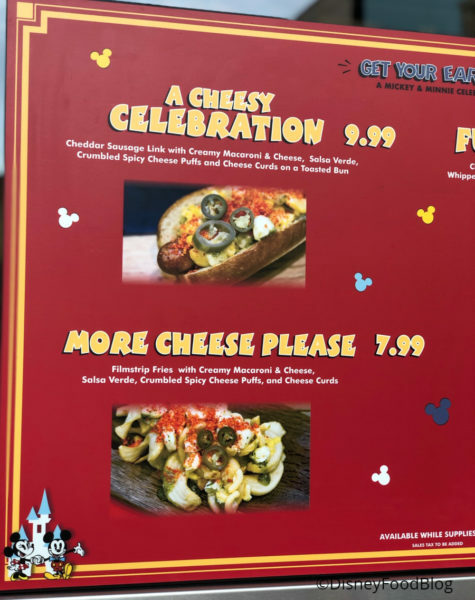 Award Wieners has two options: A Cheesy Celebration and More Cheese Please! Award Wieners Get Your Ears On Goodies! 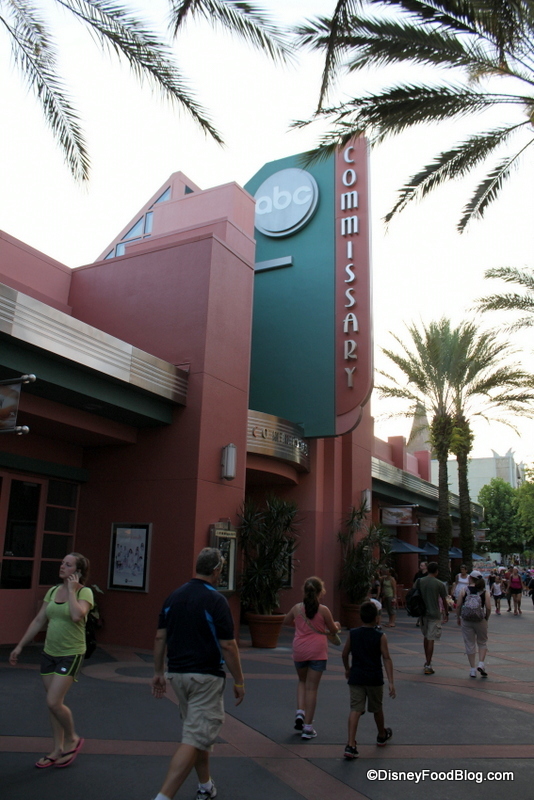 When we were in Hollywood Studios last week we told you about a recent newcomer to the ABC Commissary menu, the Southwestern Steak Fries. Well, we went home and couldn’t stop thinking about those fries, so we were back at the ABC Commissary this week to give these a try! NEW! Bacon Mac and Cheese French Fries = Carb Heaven in Disney World! Um….THIS IS NOT A DRILL. 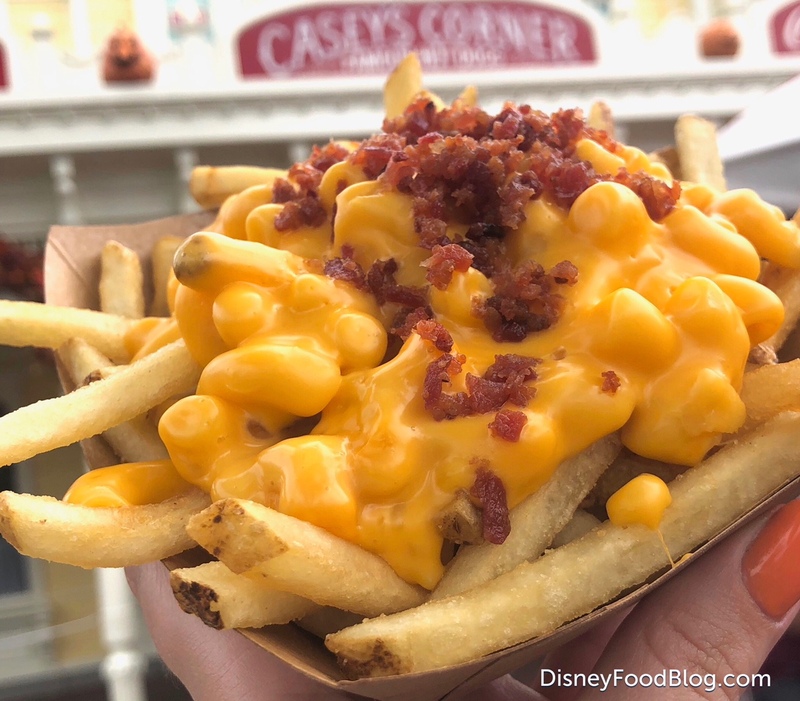 Casey’s Corner has made the ultimate “two great tastes that taste great together” in their BACON 👏🏽 MAC 👏🏽 AND 👏🏽 CHEESE 👏🏽 FRIES! Yes, that’s correct. It’s french fries. With mac and cheese on top. Why have we not done this before? Those famous Casey’s french fries have gotten a couple of makeovers on the new Casey’s Corner menu. 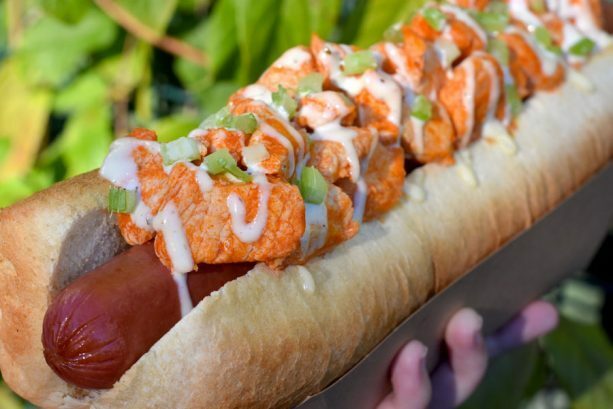 First up, they’ve been doused with that electric orange mac and cheese that’s used on the mac and cheese dog here, and then dusted with bacon bits to boot. 22 Sauces?!? 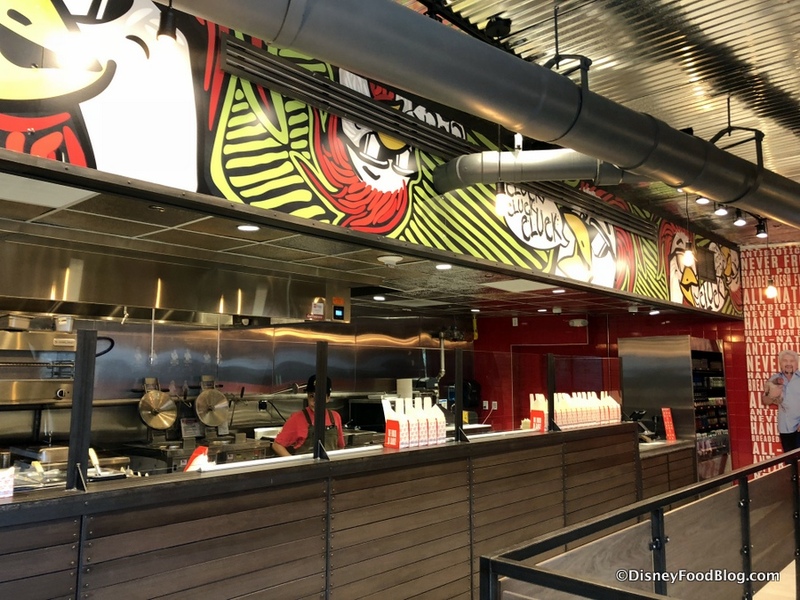 First Look and Full Review of Chicken Guy in Disney World! We were invited to take a sneak peek at the newest restaurant coming to Disney Springs… and that’s Chicken Guy! When Disneyland Splitsville Luxury Lanes opened in Downtown Disney in California, guests were elated. The long-awaited bowling-alley-with-eats was finally open — and it did not disappoint! 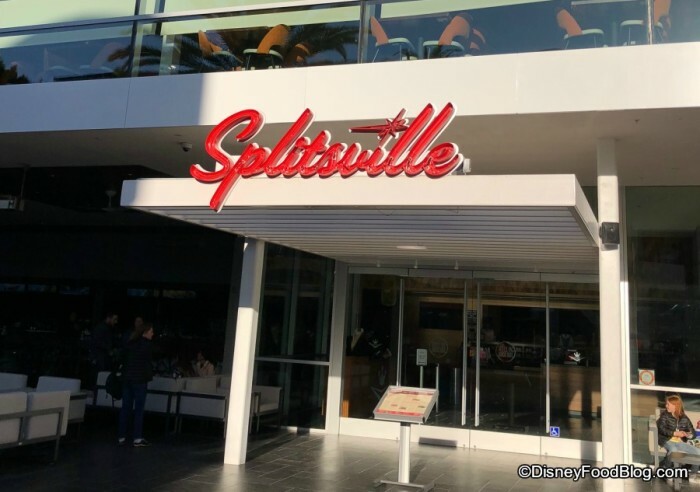 Enter: Disneyland Splitsville Luxury Lanes! 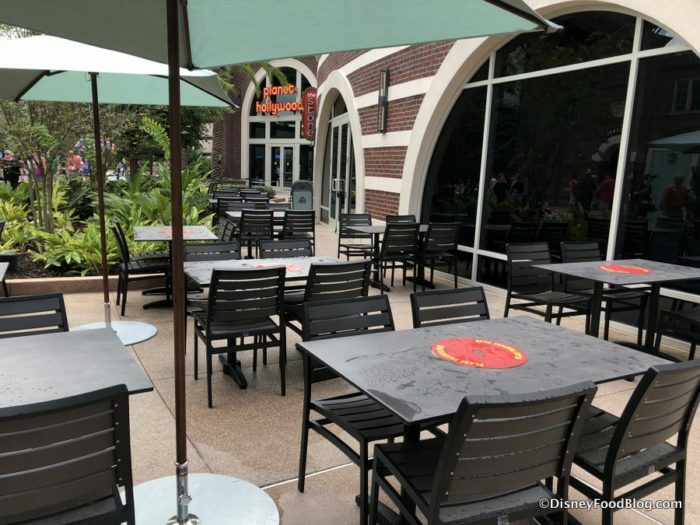 Disney Food Challenge: The Disney World French Fry Crawl! Y’all!!! It’s time for some FRONCH FROES!!!!!! We’ve got TONS of food crawls in our DFB Guide to Walt Disney World Dining, and in our latest edition, we just had to develop a brand new one– the French Fry Crawl! But now, back to the subject at hand. Call ’em Fries, Chips, Poutine, whatever — there’s pretty much nothing about fronch froes we don’t love. And Disney hasn’t failed us with their yummy spins on this classic side. Our first stop is Beaches and Cream. Find this little Soda Shop in the Disney Beach Club Resort. Beaches and Cream is one of my favorite stops for about a million reasons. There’s a cool, beachy retro feel to the place, and it’s known for its killer sundaes. While my favorite is the No Way Jose, the most iconic treats here are the Kitchen Sinks. But we’re stopping here today for a plate — or two — of their Loaded Fries! 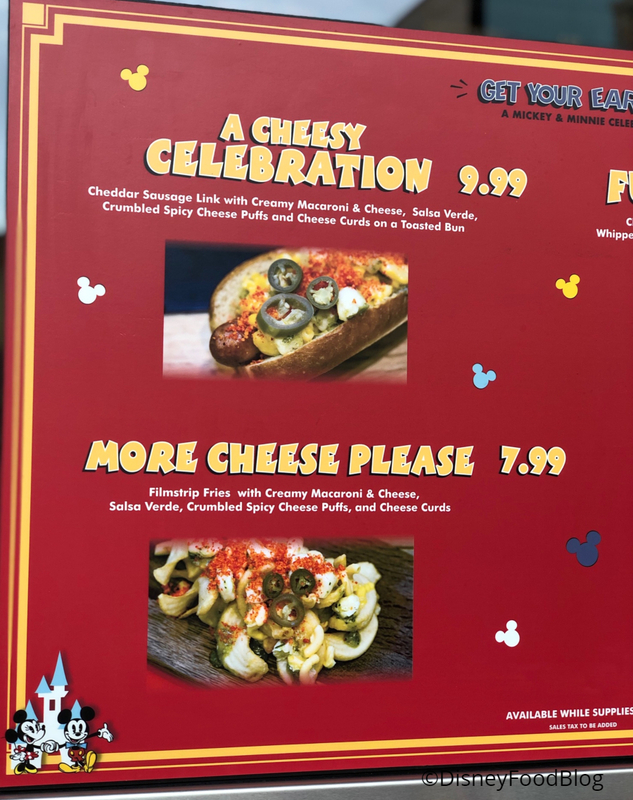 Currently, there are three versions: Sock Hop Fries, Chili-Cheese Fries, and Cheese and Bacon Fries. 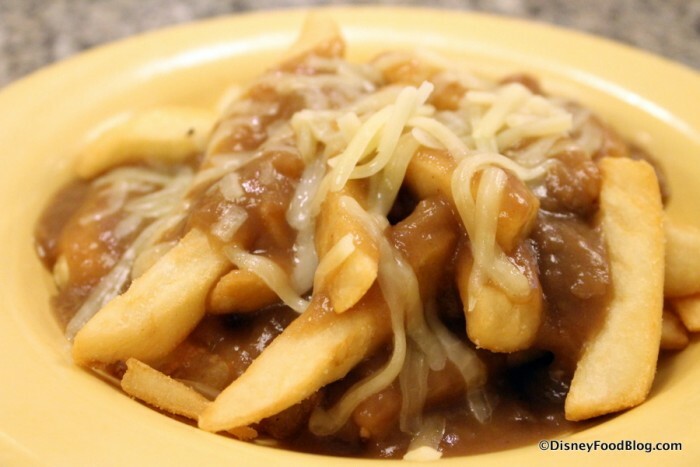 Sock Hop Fries are covered in a savory Brown Gravy and topped with melty Shredded Cheddar. Think of them as Poutine’s American cousin.